Ottawa, ON, December 16, 2013 – According to statistics released today by The Canadian Real Estate Association (CREA), national home sales were little changed in November compared to October. National home sales edged 0.1% lower from October to November. Actual (not seasonally adjusted) activity was 5.9% above November 2012 levels. The number of newly listed homes rose 1.8% from October to November. The national average sale price rose 9.8% on a year-over-year basis in November. 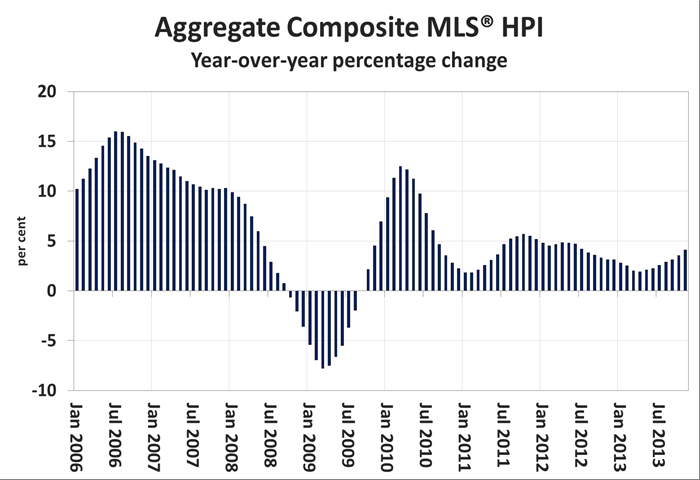 The MLS® Home Price Index (HPI) rose 4.1% year-over-year in November. 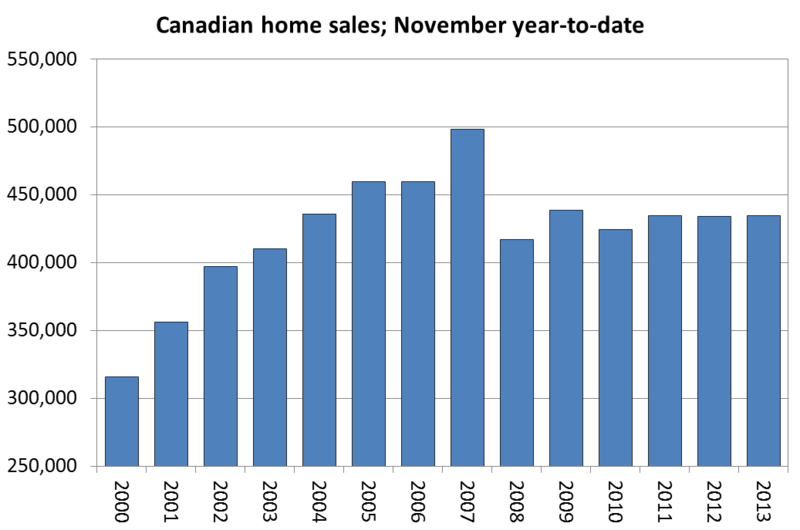 The number of home sales processed through the MLS® Systems of Canadian real estate Boards and Associations and other co-operative listing systems was little changed in November 2013 compared to October, edging down by one tenth of one per cent. National sales activity in November stood 3.4 per cent below the peak reached in September, providing further evidence that activity in the later summer and early fall was likely boosted by homebuyers with pre-approved mortgages at lower than current interest rates jumping into the market before their pre-approvals expired. Local markets where sales improved on a month-over-month basis ran roughly even with the number in which activity edged back in November, with a decline in Greater Toronto offsetting an increase in Greater Vancouver. November’s seasonally adjusted sales figure stood slightly above (0.7 per cent) but roughly in line with the average for monthly sales over the past 10 years. 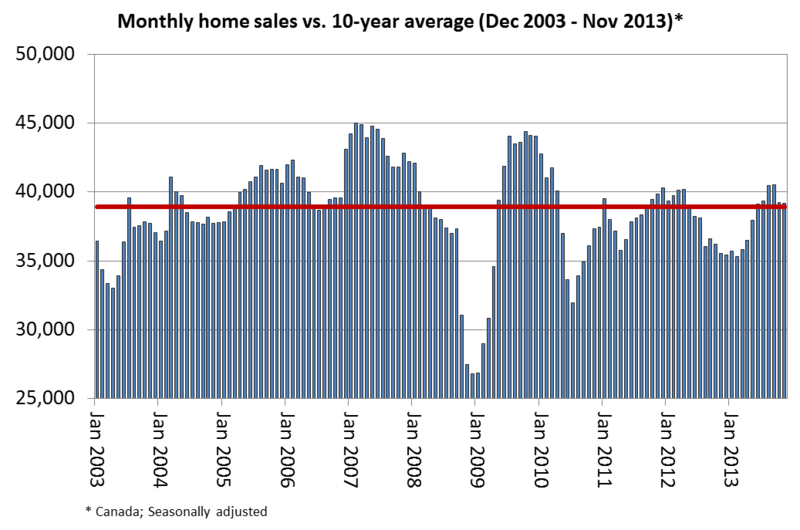 Actual (not seasonally adjusted) activity was up 5.9 per cent from November 2012. Year-over-year increases were posted in about half of all local markets, led by gains in Greater Vancouver, Calgary, Edmonton, and Greater Toronto. On an actual (not seasonally adjusted) basis, a total of 434,678 homes have traded hands across the country so far this year. This represents an increase of 0.2 per cent compared to levels recorded in the first 11 months of 2012. “While there has been a lot of volatility in sales activity from month to month, sales for the year to date are on par with fairly steady levels posted for the same time period in each of the past five years,” said CREA Chief Economist Gregory Klump. The number of newly listed homes rose 1.8 per cent on a month-over-month basis in November. New supply was up in a little over half of all local markets, with a jump in BC’s Lower Mainland outstripping small declines in Greater Toronto and Ottawa. With sales activity flat on a month-over-month basis and new listings up, the national sales-to-new listings ratio slipped to 53.4 per cent in November compared to 54.5 per cent in October. This remains well within balanced market territory, as has been the case since early 2010. Based on a sales-to-new listings ratio of between 40 to 60 per cent, about three out of every five local markets were in balanced market territory in November. There were 6.0 months of inventory at the national level at the end of November, unchanged from one month earlier. As with the sales-to-new listings ratio, the current level of the months of inventory measure indicates that the Canadian housing market remains well balanced. The actual (not seasonally adjusted) national average price for homes sold in November 2013 was $391,085, an increase of 9.8 per cent from the same month last year. The size of year-over-year average price gains continues to reflect the decline in sales activity last year in some of Canada’s larger and more expensive markets which caused the national average price to drop at that time. Removing Greater Vancouver and Greater Toronto from national average price calculations, the year-over-year increase is more than cut in half to 4.3 per cent. The MLS® Home Price Index (MLS® HPI) provides a better gauge of price trends, as it is not affected by changes in the mix of sales activity the way that average price is. Year-over-year price gains were led by one-storey single family homes (+4.88 per cent). This was closely followed by two-storey single family homes (+4.59 per cent), townhouse/row units (+3.13 per cent) and apartment units (+2.46 per cent). Year-over-year price growth in the MLS® HPI was mixed across housing markets tracked by the index, led by Calgary (+8.82 per cent) and Greater Toronto (+5.69 per cent). Greater Vancouver recorded the first year-over-year increase (+1.02 per cent) since prices turned lower last year.